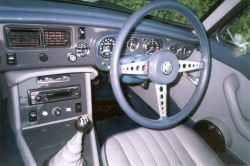 The interior was trimmed by a Rolls-Royce coachbuilder who runs a trimming business in his spare time. 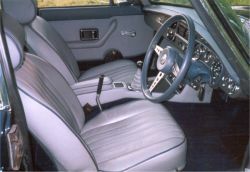 Three Connelly leather hides were used for the seats, console and side panels. Wilton carpet was used for the floor and West of England cloth for the headlining. The intention was to have the feel and smell of a Bentley. The layout of the interior has been slightly altered to increase comfort and to reduce noise levels. I'll cover more details in the noise section. 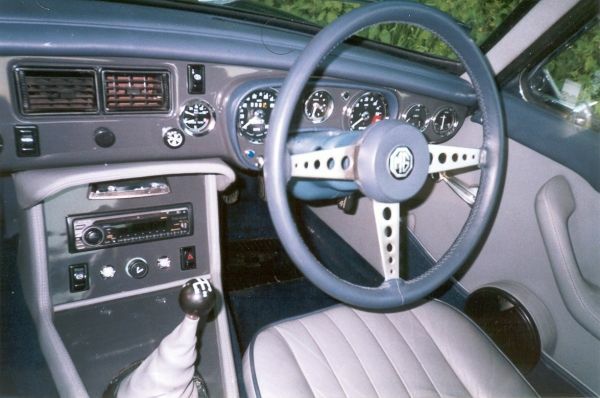 I used a dashboard from a 1976 rubber bumper MGB so I could fit original V8 instruments and a collapsable steering column. The lip above the instruments has been extended to prevent reflections in the windscreen, and a further lip has been added above the centre console for the same reason. I joined the two pieces of the console together using fibreglass and removed the seams before the console was covered in leather. The console is finished with metal plates painted grey/brown to match the dash. Extra features include a variable speed intermittant wiper switch positioned below the cold air vents, a CD player, and an extra warning lamp on the console for the flashing immobiliser LED. I modified the door to incorporate an arm rest, map pocket and speaker. The arm rest was made from layers of wood glued together then smoothed off and trimmed. 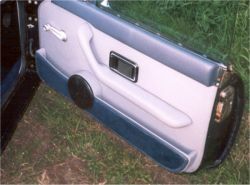 The speaker housing and door pocket formers were made in the same way then faced with plywood and covered. The doors also feature central locking supplied by MOSS, and this is tied into the immobilser system so I can unlock the doors remotely from the key fob. The window winder handle is an aftermarket Lotus Elise part. The door trim extends forward of the door to act as a sealing face for the door seal. 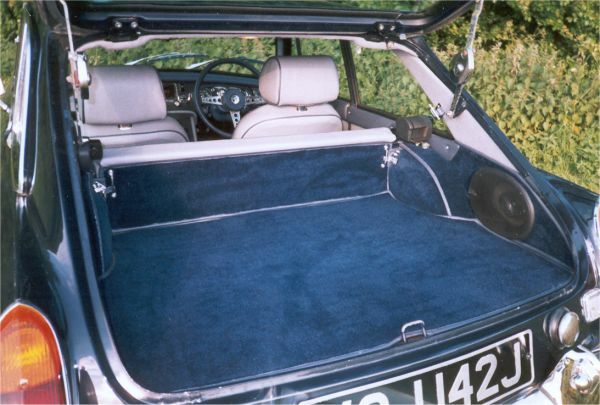 The boot layout is standard apart from the sides which I boxed in to incorporate rear speakers. The carpet used throughout the car was supplied by Wilton. The headlining is West of England Cloth. The original headlining was used as a former for the main headlining, and I made fibreglass formers for the cant rail and header rail headlining. As far as possible I used 'fir tree' fasteners to fix the trim to the car to avoid exposed screw heads. The new seat base foam and webbing took 15,000 miles to settle down into a comfortable position.